Team news: Milan were without Pepe Reina, Ivan Strinić, Mattia Caldara, Cristian Zapata, Lucas Biglia and Giacomo Bonaventura, while Napoli had to do without the suspended Simone Verdi as well as without Vlad Chiricheș, Elseid Hysaj, Raúl Albiol and Amin Younes. 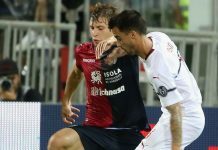 Kick off time for the quarter final of the 2018/19 Coppa Italia was 20:45 CET at Stadio San Siro. 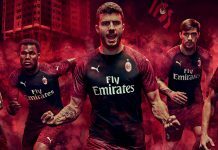 Gianluigi Donnarumma; Ignazio Abate, Mateo Musacchio, Alessio Romagnoli, Diego Laxalt; Franck Kessié, Tiémoué Bakayoko, Lucas Paquetá (85′ Ricardo Rodríguez); Samu Castillejo, Krzysztof Piątek (78′ Patrick Cutrone), Fabio Borini (60′ Hakan Çalhanoğlu). Unused: A. Donnarumma, Plizzari, Calabria, Conti, Bertolacci, Mauri, Montolivo, Suso, Tsadjout. 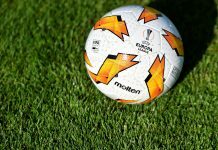 Alex Meret; Kévin Malcuit (85′ José Callejón), Kalidou Koulibaly, Nikola Maksimović, Faouzi Ghoulam; Fabián Ruiz Allan (46′ Adam Ounas), Amadou Diawara (58′ Dries Mertens), Piotr Zieliński; Lorenzo Insigne, Arkadiusz Milik. 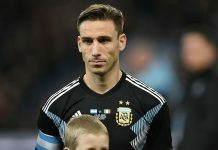 Unused: Ospina, Karnezis, Luperto, Mario Rui, Hamsik, Gaetano. Why do we have only 2 strikers. Please no one should mention Borini as a striker. We all remember when Higuain and Cutrone were injured. I am more concerned about the game against Roma than this. Nonetheless, I hope Milan wins. Thanks Suso is not in the starting lineup. Thanks Mathijs, nice to meet you too. People complains about us fielding Borini because while he is a workhorse, he runs around like chicken without head and contributes very little. He is actually taking away time from other players. Piatek and it’s 1:0!!!!!!!!!!! Hells yeah! Piatek 2:0!!!! He is awesome!!! Man I cannot believe I’m missing the game! Aw man feel sorry for you, Napoli it’s playing better, but Piatek has been effective. Ted you can Watch it on youtube in good quality. I can’t believe what is currently seeing.Higuain though a fantastic player but plays as if he is much more bigger than the team. Piatek is my kinda striker…talks less, never smiles.. but in end get the job done. 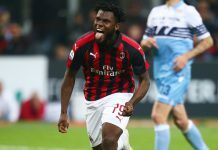 Absolutely agree besides of not scoring enough higuain pretty much paraded an attitude problem for a large duration of the time he played for us and from when i heard there was a possibility of us getting piatek i was super exited as i didnt really expect us of getting that chance as barca had been mentioned as a possible destination through season. Glad higuain left us and feel confident that we pulled the longest straw in that equation. Can I get the link please? sorry didnt see your post as i was occupied by the match but another time just type in team vs team and look up daily uploads and if that doesnt Work try for example rojadirecta. Guys thanks for the heads up! No problem Ted glad to help and hopes it helps you getting access to all the future matches you wanna Watch. Is Pion tek really human?? His movement and instincts are just inhuman.. wow!! Well said mate. I watched his debut as substitute, and somehow I felt so familiar with him. Finally I understood why. Great goals what a striker!giving the supposed best center back in world nightmares!lol.bayo brilliant,defence good borini having a nightmare as usual. Honestly am impressed with what Milan is playing. Napoli are running around like Borini. I want to see more of Laxalt than Rodriguez in our matches. Piatek is what we have been missing. In the second half remove Borini and bring in Mauri and push paqueta to the wing. Lol. Thank you Chelsea ! I’m sorry Carletto it’s only business. Hahaha. Mate, I’ve been a hater of Laxalt, but he was fantastic tonight, hope he’ll keep it up and he’ll prove to be a valuable squad player! He is a good player. The problem is we have been playing him out of position. Playing as a makeshift midfielder for Genoa is not the same as for Milan. I was going to ask you about Laxalt, he is a solid back up mate. @Nick – yep, we’re “haters” for pointing out the obvious that Milan have been garbage all season. One decent game in which Gattuso finally got it right and all of a sudden we’re freaking Juventus. Yes but dropping points left right and center against useless opposition most of the time doesn’t matter in their eyes… We’ve hit the reset button after one game and the previous six months have just been erased from memory! Simples! 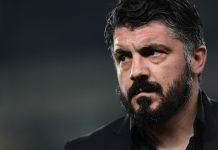 Piatek looks good though if he can keep it up and I hope Gattuso can turn things around, but unfortunately I just don’t think he’s ever going to turn into Ancelotti. Thanks for the analysis bro, couldn’t watch the match on account of work. Super result by us, especially considering we kept a clean sheet two matches in a row against one of the best offensive teams in Europe. @Baresis Dream…Yeah, Milan played well. Piatek was very impressive. He had two chances and he scored 2 goals. I feel like Milan now has the right type of striker we needed even though it’s still his first start, but Piatek made Koulibaly look like a schoolboy. Glad Chelsea took Higuain off our hands. Probably the best signing for us. His work rate and attitude is pure class. There’s optimism now but we still need a LW in my opinion. @Baresis Dream, too bad you missed it mate, must have been happy just seeing the result though:) Hope the performance and result will be there vs Roma too that you can enjoy! Like you said, not every team that can keep a clean sheet twice in a row vs Napoli! @nick, agreed, a pacey and trickery LW would help this team so much. Slowly and steadily LeoDini are helping Rino building a proper team. With Bona, Caldara, and Biglia back we’ll have plenty more options from the bench too, just that proper LW that is missing! Hmmmm,loving Piatek? 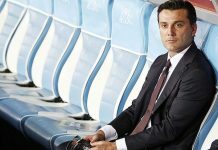 I’m not a pessimist but let’s give him sometime.forza Milan!!! We could say that If Donna was to conceive any one of insignes shots, it could’ve been a totally different game. We were dominated and outskilled in the endgame, to a point where Napoli’s defensive line were doing skill moves on us. Forced to play way deep in our field, or maybe our only tactic was to park it. But let’s enjoy the moment, the goals were beautiful and defense was solid. We don’t want to jinx anything FORZA MILAN. Positive things at San Siro, but there was something that got me worried. Patrick Cutrone, I saw the word disappointed in his face. Every time he received a bad pass he showed frustration, the same expression could be seen when he lost possession. Cutrone would give a thumb up to motivate or run harder to recover the ball.. The boy was always smiling and that was missing today…. Agreed. I hope he’ll get over it soon. 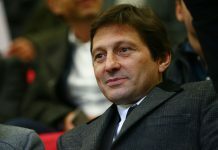 He wants the number 9 position and is disappointed that Milan didn’t trust him with it, and signed a player around his age. I really hope in the future there are some games that both Piatek and Cutrone start. Cutrone would be a starter in any midtable team, and he’s craving that first team experience. 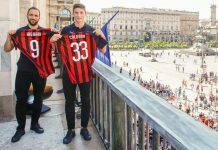 I honestly believe Cutrone wanting the #9 position is why Piatek wasnt given the number right away. Leo wants them to compete against one another to earn the number. Probably he’s frustrated that he hasn’t scored in a while, no? 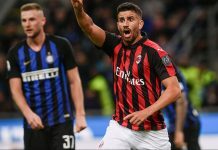 Cutrone started the season knowing he would be second fiddle, and he knows that he will get sufficient minutes even if Piatek turns out to a huge success. I’ll open a go fund me to buy Bakayoko, what a beast, not missing Biglia or Montolivo, even Kessie looks average next to him. Forget about SMS get Chelsea whatever they want, he is working fine with us, and I’m sure that he’s loving all the minutes he’s getting. What a difference when Suso doesn’t play huh?! Now the striker scores!!!!! Twice!!!!!! Yup my intelligent brother, Suso blocks almost every single attack with his stupid insight moves or inside bad passes. No wonder Higuain went away. Irreplaceable player in our team? Bakayoko is arguably the best midfielder in Serie A at the moment. He was great. Provided the assist for Piatek, and hustled tremendously, took more of a defensive duty tonight, and did excellent. PaSqueta as the commentator tonight kept saying lol. I feel sorry that you missed the game. Hope the game vs Roma will prove to be as good and that you can take part of it! Totally agree. He reminds me more of Shevchenko than Tomasson. Agreed. But there’s a feeling in the air that Milan finally have the right striker we needed to pair with Cutrone. I mean, Piatek 2nd goal was out of nothing. He created that on his own and his finishing is so devastating. I like most of what you said, however, you have to consider the financial position of the club, uefa sanctions and Elliot fund. Scrolling through ig I found a fan view video of Piateks second goal, and I teared up. Idk why haha, I mean we’ve had good games in the past, maybe since it’s Napoli ? Last time we beat Napoli was 2014. 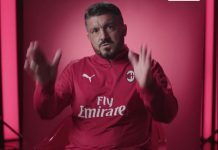 Hats off to Gattuso for having a good record vs top teams, exception of Juve. Must say most credit goes to our defense, Dona has saved us many times. One game at a time, FORZA MILAN!!! Bakayoko played another galaxy level of football compared to the others. Don’t get me wrong, whole team played well, but Baka was great in every part of the pitch. I was amazed and sure I wasn’t the only one. As a football fan and more specifically, a staunch Milan fan; I have hated Chelsea for over a decade after they priced away Shevchenko from Milan. Kaka helped us power through 2006/2007 but we never really recovered from that loss until now. I sincerely believe that Piatek is the perfect replacement for Sheva and will have a similar career. As if this goodwill is not enough; Chelsea gave us BAKAYOKO!!!. While all these were unintentional, I am truly grateful and finally forgive the blues. FORZA MILAN!!! I wonder where our “GattusoOut” fans are? Now people finally see how inefficient Suso is. Ironic how two of the biggest haters of his are remaining silent after this win. Can’t even congratulate the team for the performance and the win! Milanista121, absolutely fckng right. They’re just fake. How is Sweden these days? @Mathijs, it’s allright man, same old same old. Things have cooled down now after the election and the racists aren’t getting too much room which feels good. Back to normal. How’s netherlands mate? Is Bergwijn the real deal? 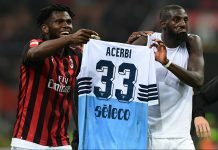 @Milanista121 – Give us a chance, Jesus! Now the main question is who are our best full backs and Centre backs? That’s a real valid question my South African friend. 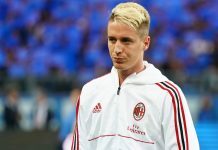 I think Conti should play every game when he is fit. For the left back position, I truly desire the aggression, passes and speed of Laxalt. But sometimes the rest of Rodriguez is better and then his slow and passes are poorer. Hard to say. You’re absolutely right, and you’ve been one who haven’t sticked to your opinion like glue just for the sake of it, you’ve been given criticism and praise when it’s been due, and that’s what’s fair. I really hope that those weird substitutions are a thing of the past. Also think that @nick gives credit when it’s due, my post about haters are meant for some specific people who just seem to want Rino to fail just to say “i told you so” – based on the nature of their posts, and how they’ve remained silent now after this game too. @Naz – I might post my list again of all Gattuso’s failings that’s about as long as my arm and see if I get a logical response to any of them, because last time all I got was tumbleweeds. Er, I only wrote that about reposting my list because you called me and Milan10 “haters” who’d gone silent, implying Gattuso’s mighty performance had cowed us into submission. I can’t speak for Milan10 but I’m not always near a laptop to leap onto RossoneriBlog as soon as the match finishes. And no my opinion’s not going to change after one win against Napoli in the Coppa Italia. You’re always quick to comment when we’ve been poor or had a negative result though, because whenever I’ve checked rossoneriblog, I’ve seen your comments… but not this time:) You’re making it sound like a win vs Napoli isn’t that great just because it was in the Coppa… so you’re proving my point with the “haters” statement. But allright man, you do you. Yes, but it’s one game. As I said he’s been useless all season and one game isn’t going to make me think he’s a great coach all of a sudden. Let’s see what happens against Roma for a start before we start having multiple orgasms. Suso should be played as a 2nd reserve striker, super sub or stay in bench. As a winger too slow. As a midfielder lack strength. 1/2 of the big games he is marked out. If you are looking for the most up to date Milan Breaking News, Transfer,Articles, Discussion then add us on WhatsApp 08131515005. They say milan have made one last assault for carrasco. 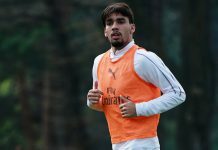 His club is open to a dry loan while arsenal ended their pursuit. And candreva won’t leave inter. Milan are the only team who can sign him before deadline. For summer they’re highly interested in Allan saint-maximin. Gianluca Di Marzio is reporting that Leonardo has made another final attempt to sign Yannick Carrasco by Thursday. I’m in dreamland right now as it seems like we might get him ahead of Inter or Arsenal. Thanks man, good assessment! Also thin that Simeone and Rino are kind of similar so if Carrasco enjoys that type of coach it could’ve been a good buy, but it seems like it’s not going to happen… I even got somewhat exciting for his signing… Also looking unlikely for us to get a LW. It’s a huge necessity that we get a LW, but I’m glad we’re not buying a LW just because, kind of the way we bought Samu, and are thinking it through. Fiorentina are smashing Roma – 5-1 right now. I think that having Nzonzi and Cristante suspended wont be a big blow for Roma, Nzonzi has been horrible and Cristante is like Pasalic, invisible but then he scores a goal. Hope it won’t prove to be a blessing for them. Hope their confidence will be low while facing us confident. As long as the confidence wont turn into arrogance. How are you guys feeling for the coming game vs Roma? No matter the form of the respective teams, it’s a must win and will be huge if we pull it off! Dzeko will also be suspended and that’s a big loss for Roma. Can’t tell for sure but it looked like he spit at the ref. But he got his suspension in the Copa, it won’t count in the league now will it? That’s what I thought too. I’ve heard a few commentators say that as well but it’s kinda strange how it’s applied. So we will have to wait and see. Right now they look like a team in crisis while Milan seems to be hitting form at the right time. Hopefully we can take advantage and beat them this weekend. Didn’t league games count in relation to the Italian super cup earlier this month? So presumably same applies between Coppa Italia and Serie A.. I’m not really sure either though.. I don’t think Dzeko will be suspended in the league ..otherwise Suso could’ve served his suspension in the Coppa against Samp and be available for the Super cup vs Juve.